Our GPS was taking us on some crazy route from Athens to Nafplio! The views were spectacular, but the roads were not. They were narrow, badly maintained, and weaved up and down hills and through towns. The locals passed on corners and zipped down the road as if it were a freeway. There were many turns that were close together, and it seemed the GPS was slightly off on the map, so that it would tell us to turn 50 meters too early. The strangest thing was we appeared to be weaving back and forth beneath a major motorway! “That must be for pass holders only,” Nate suggested nodding towards a toll gate. “It’s probably just a toll route. Nate…” I laughed, “Do you still have your avoid toll routes setting turned on?” We have a very expensive toll route near our old home in Toronto, so we had our phones preset to avoid it. It was, we had full views of the coast, and the sea opening up to the horizon. It took us roughly three hours to drive the scenic route, as opposed to two on the highway. By the time we were approaching Nafplio it was dark, and the narrow corners were even more nerve wracking! As the sun went down, little lights started turning on in the mountains around us. Every ruin or archaeological site was lit up. I felt this deep sense of amazement as I looked out at each snaking fortress, or towering castle. When we got to our Airbnb (which was down a very narrow street that was easy to miss) we could see the Palmadi fortress in Nafplio lit up on the mountain across from us. We went into town for dinner that night, and there was a live band playing Greek music. There were three band members, and they were sitting around a table. 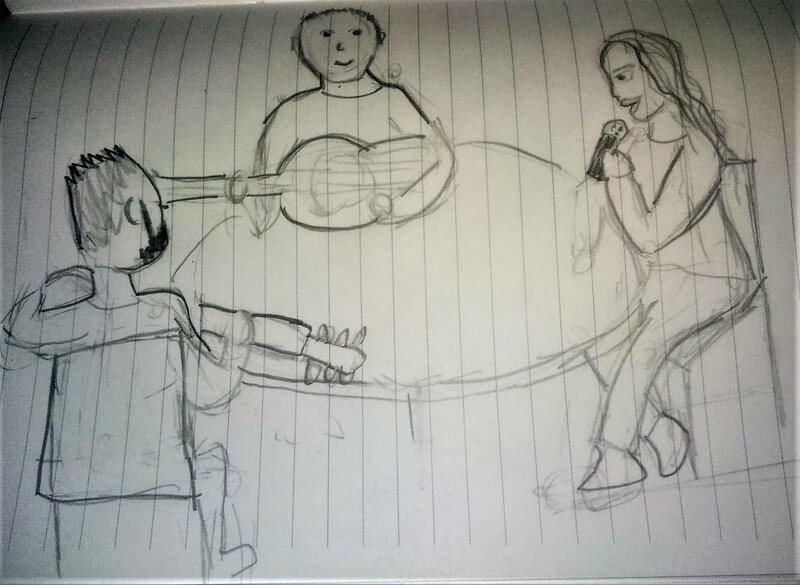 Two were men, who were playing guitars, and the third was a woman on vocals. It was late and all three of us were tired and hungry. Felix who had been getting fussy on our way to the restaurant, immediately calmed down when he heard the music. The food came out, and the family at the table next to us smiled and laughed at Felix. The place had a beautiful atmosphere. Nafplio was right. What is the craziest road you have driven on? Share your story in the comments below!